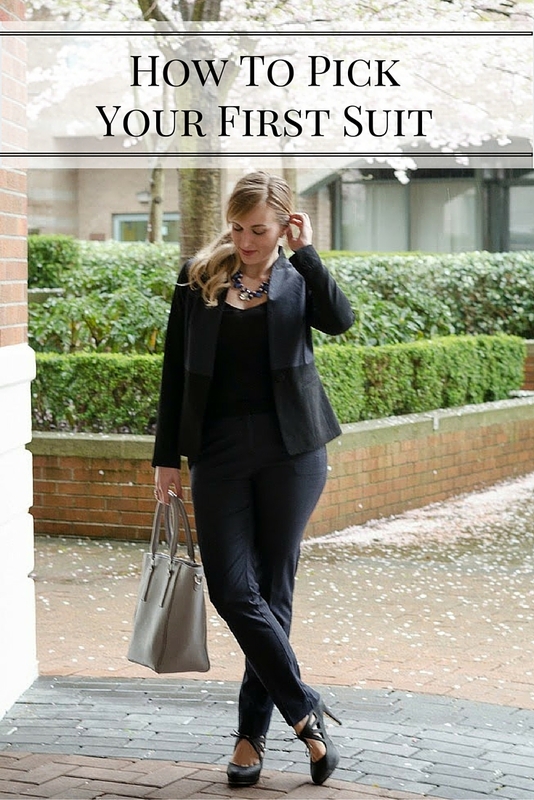 I try to showcase a lot of wear-to-work outfits that are work appropriate, but go beyond just a basic suit. However, suits are a must have in your closet if you are a young woman working in the professional / corporate world. Even if you work in a laid back industry, there are times where a classic suit is just a necessity. Today I wanted to share some tips on how to select your first suit. Suit shopping can be a daunting task – especially for women – so these tips should help make the process easier! I’ll also link up my favorite places to buy suits. Do you work in a ‘big business’ accounting firm, a boutique law firm, a tech start-up? Knowing your industry is essential to determining the type of suit you need. For more ‘corporate’ industries you will want to to stick with a classic shape. The more relaxed, the more you can experiment with cuts/shapes. Personally, I live in ‘skinny pant’ suits. For a first suit, stick with the basics – navy or dark charcoal gray or most common. Traditionally the rule was to shy away from black as it is too harsh. Personally, I think that rule is outdated now and I see many young lawyers with black suits as their first/primary suit and it looks great. If you are in a more strict environment, or are planning on going to numerous interviews in your first suit, skirt suits are still recommended as the most appropriate style for women. That said, it’s 2016. If you feel more comfortable in a pant suit, go for it. I personally don’t like skirt suits and did every law firm interview I had following law school in a pant suit. Suits can be as diverse as jeans. Take a ton of suits into the change room to see how different fits sit on your body type. Longer vs. Shorter blazers will look different on different bodies, as will one, two or three button blazers. Try them all on to see what look suits you best before narrowing your search to suits in that particular fit. Luckily, it is becoming easier to find stylish women’s suits. My personal favorite brands/stores, by price point, are below. "Finding the Best Blazer for your Body Type"
This is such a great post!! Very informative!! My first suit was from Ann Taylor and it was a total investment but I've had it now for over 6 years!! Thank you so much Pau! And ahh yes Ann Taylor stuff is so great!! Great tips here. I got my first suit ever at Lord and Taylor. Ann Taylor, The Limited and White House Black Market are also great for suits. =) You are so chic in all black! Thank you so much! And ahh yes those are all great picks! Great tips. My first suit was a Calvin Klein I got on sale at Yonkers, and I was hooked! Ooo such a good score! I've never actually had a CK suit – but I've heard great things! Yay im not the only one! I just feel more comfortable in a pant suit. I like that there's so many options to mix and match with Express! Really great tips all around, Lee. I happen to like black suits and think they are really versatile. I also usually purchase the skirt and pant to have more options, but I tend to lean towards the pant suit. Thanks gorgeous! Yes i LOVE when you can get both a skirt and pants – its just a great way to have more options when you're getting dressed. Thanks for sharing your tips! I have a skirt suit (too hot for pants here most of the year) I wear to interviews but I don't need it regularly in the office. I think I'd probably need a new one if I was to start interviewing again! Thank you for reading them!! And ahh ya if it's hot definitely it's better to have a nice skirt suit! Great tips, I totally agree with your #1 rule that it is so so important to know your industry for how to dress appropriately. If you're in a more corporate environment rather than playing with the style of the suit you can let your personality show with the top or appropriate accessories. Thank you so much! Exactly! Accessories are key if you're in a corporate environment – a basic black pencil suit fits the environment but you can still throw on a great statement ring or necklace!